Adam Hinshelwood felt Worthing's first pre-season defeat last night was a 'kick up the backside' for his squad. Worthing lost 3-2 at Southern Combination League Premier Division side Chichester - who had won 16-0 at Wick on Saturday - and trailed 3-0 after just half-an-hour. Goals from trialist Curtis Gayler and Ross Edwards got Worthing back into the match but Chi held on to win, as Worthing fielded a number of youngsters in the closing stages. 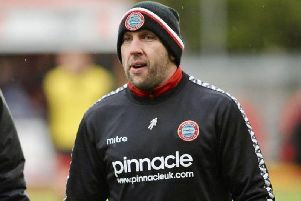 Hinshelwood said: "We went 3-0 down quite early, which isn't a bad thing in pre-season as it's a bit of a reality check. "Sometimes you can cruise in pre-season when you're winning games and it can mask things. This showed where we need to improve in certain areas and where we have to get better as a team. "In some ways it gave us all a kick up the backside but we showed a good response in the second half. "We pushed for the equaliser but we made changes around the hour like we'd planned. "We were playing against a good Chichester side and if I'd been ultra fussy about the score, I'd have kept some players on but we stuck to our game plan. "It was a good experience for the younger players and they'll have learned a lot from it." Hinshelwood hopes to know by the end of the week if any of Lucas Covolan, Reece Meekums, Aarran Racine and Alfie Young - who are all looking to get deals with higher league clubs - will be back with Worthing next season. Goalkeeper Covolan played for Stevenage in a friendly against Portsmouth at the weekend and the League Two club are expected to make a decision on his future this week. Young has been told he will not be offered a contract by Aldershot, so Hinshelwood is set to speak to the defender to see what his plans are. Meekums has been playing for Bromley and Racine has featured for Dagenham. Hinshelwood hopes to find out in the coming days whether they will be back. Hinshelwood said: “I'll speak to Alfie today to see what his plans are as he might have something else lined up. "I'll catch up with the others at some point this week too. "We’re getting closer and closer now to our season kicking off, so we want to know what’s happening with them. "In an ideal situation, we'd like to have everything in place by the end of the week. "But I'm still patient and calm about everything. Things can happen quickly and we'll just wait and see what happens." Hinshelwood will also speak to trialists Gayler, Leon Dramis and Danny Bassett about their futures this week.